Thanks Rich for the great advice. I am new to the pre-paid meter world, so please excuse my ignorance, I spend roughly R2100 per month and am with Joahnnesburgs City Power. FNB used to offer (upto) 15% back on prepaid electricity spend (through their ebucks program). 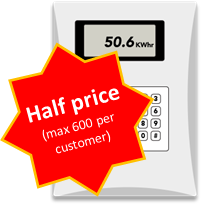 Due to the fact that this incentive will be discontinued from the end of this month (30 June 2017), I thought that (in my infinite wisdom), I would purchase as much prepaid electricity as I could possibly afford so as to maximise my 15% saving. Are their any cons you can think of? Is their a maxmum amount of units one could purchase in a given month? Would it push up the cost of my cost per unit at a certain level whereby it will not be a lucrative option anymore? Is their a maximum amount I should purchase?